Retailers, manufacturers and wholesalers routinely work with professional product packagers to bring distinctive presentations to market. Food packaging, in particular, helps food purveyors compete in crowded consumer categories, so bringing new looks to retail shelves is a mission shared by food processors, producers, retailers and packagers. Although successful food packaging often relies on time-tested methods and standards, the industry evolves continually, making way for inventive food packaging solutions. 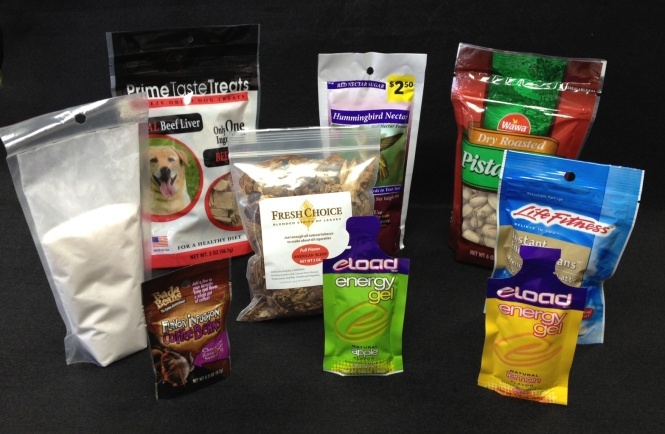 As you prepare to market your product line, consider these important concerns unique to packaging liquid, powder and solid food products. Whatever your food packaging needs are, experienced contract professionals have strategies available to show your food items in their best retail light. Refining your mission statement helps guide your packaging decisions, starting with these preliminary concerns. Budget – Quality and functionality are important packaging considerations, but each packaging project is governed by a realistic budget. The value of a product, its size and shape, as well as the retail outlets in which it is to be sold each influence the best packaging approach, but prudent planners also account for packaging costs up front. In many cases, product packagers offer several viable packaging alternatives, enabling producers and wholesalers to weigh the cost benefits of each packaging style. Turnaround – Once you and your packaging consultant have narrowed your approach to a couple legitimate food packaging alternatives, the next important step is to identify timelines for completing food packaging projects. When deadlines are short, one form of packaging may outshine another, for efficiency and availability. Certification – Food packaging is regulated by the FDA, so foods must be produced and packaged according to various standards applied to particular food items. Packagers are held to the same standards as producers, so the proper certifications must be maintained by each facility packaging your products. Organic, kosher, SQF, NSF, GFSI, UNFI, Gluten-Free and other food packaging certifications also help your product line stand out among competitors, so working with certified co-packagers ensures compliance, quality and originality. Turnkey food packagers offer a variety of services capable of guiding your next product packaging project from start to finish. Selecting the right packaging partner ensures problem-free execution, based on industry-best food packaging standards. Development and Design – Positive branding is essential to success, so packagers utilize every available advantage to send your organization’s messages. Graphics, text, iconography and proprietary logos and artwork are used to distinguish food brand identity, as well as unique packaging shapes, materials, and merchandising features. Sourcing Materials – Each packaging project has unique requirements, so flexible sourcing of raw materials ensures the fastest possible turnaround and gives you access to cost-effective solutions based on local resources. Using competitive supplier networks, well-connected product packagers pass cost savings to food producers and processors, who benefit from regional supply chains. Fulfillment and Delivery – Getting the job done correctly – the first time, meets marketing deadlines and keeps goods flowing through the supply and sales chain. Whether yours is a start-to-finish contract job or another form of fulfillment, successful primary and secondary food packagers consistently satisfy delivery deadlines and furnish high-quality deliverables. Food packaging standards evolve continually, reflecting shifting preferences and standards among consumers. To stay on the cutting-edge, your food packaging project requires attention from experienced product packagers, committed to guiding your food packaging project from conception to completion. Turnkey providers use your specifications to manage fulfillment, ensuring successful food packaging campaigns for your entire retail food product line. Do you have a food packaging project and need a specialist? Use the “Get Quote” button on this page or click here, and one of packaging experts will be in touch to discuss your requirements.